Does your drug user group have an idea for SUPPORT DON'T PUNISH global day of action, this June 26th? Need a bit of cash to help it become a reality? 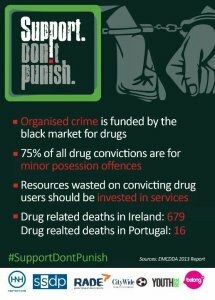 EuroNPUD is pleased to invite member drug user groups to apply for one of eight $500 grants to support a Support Don’t Punish event in your country on 26 June 2018. Last year, a record-breaking 205 cities in 93 countries joined the Support Don’t Punish campaign’s ‘Global Day of Action’. Activists, members of affected communities and allies joined a wonderfully-broad range of events and activities around the globe to decry the harmful, anachronistic, policies that structure the harmful war on drugs. From a concert/debate in Brussels, to a float parade in Accra, through drug user gatherings in Kuala Lumpur and round-tables in Medellín, people took to public spaces with courage and ingenuity; demanding drug policies that are anchored in public health and human rights. The Global Day of Action takes place on 26th June, which is the United Nations’ International Day against Drug Abuse and Illicit Trafficking – a day when governments typically celebrate their Pyrrhic “success” in enforcing the global drug control regime. Behind the self-congratulatory rhetoric of seizures and arrests, lays a trail of devastation. Families torn, prison overcrowding, increasing overdose deaths and HIV transmission among people who use drugs, just to name a few. The EuroNPUD grants will particularly support a peer-based campaign on Support Don’t Punish Day using the special peer branding “Self-Support Don’t Punish Us!”. The best 8 applications will be selected but only one grant will be issued per country. Drug user groups that are receiving twinning grants can still apply for Support Don’t Punish Grants. The quality of your English doesn’t matter as long as we can understand your plan. Janko or Erin can help you complete the form if language is a barrier. We are interested in the quality of your proposed campaign not the quality of your written English!! Successful drug user groups will need to have a group bank account or a host NGO with a bank account who can receive your grant. Grants will not be sent to personal bank accounts. Don’t worry if your group does not have a bank account and you do not have an NGO who can help you. Submit your application and we will work out how to send you the money if you are successful. This issue will not affect the assessment of your application. IDPC will provide each successful drug user group with some SDP T-Shirts. Please reach out to Janko if you need help or advice. Erin can also help you think about the communications side your campaign. If your group is not yet a EuroNPUD member, don't worry, send in an email anyway requesting membership, together with your form. Be sure to check out the SDP website which has a range of terrific resources you can use to help promote the day. For more information on the grant -contact EuroNPUD -and good luck! Logos are available from the SDP website in many different languages. Add a theme to this year's SDP day, like this one on financing better harm reduction. Or create an info grafic for your website about a drug related issue, like this one.